When I spent Thursday evening loafing instead of grocery shopping and menu planning (which, ofcourse, relegated me to spending Good Friday doing nothing, because grocery stores, etc. are not open on Good Friday)....I didn't really have high expectations of the food this weekend. For Easter, we were entertaining hubs' parents, as well as hubs' sister and her hubs (and newborn! yep, the same newborn who was the subject of much merriment back in Feb). It wasn't really a full house, but I still wanted to have some fun with the menu and put on a good spread. After some brainstorming Friday night, and some frantic (and crazy) grocery shopping on Saturday....I didn't even get down to cooking/starting ANYTHING until 1 pm. If you're at all familiar with my modus operandi, this is not normal. I like to be prepping the day before. Not midday the day of. 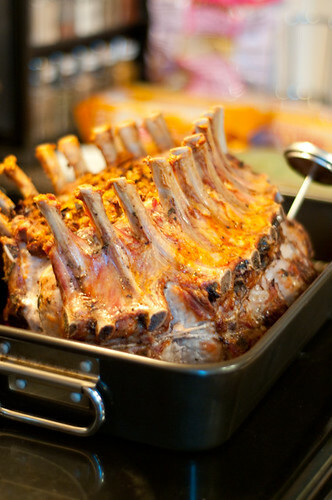 I had decided on an Easter dinner menu of crown roast of pork with onion stuffing, (because it makes sense to cook 10 lbs of meat for 7 people...), potato gratin, anise-roasted asparagus and pea salad with feta and spinach. Dessert was a three-nut maple tart with maple cream. 1. Where the recipes are (i.e., epicurious, cookbook, magazine). Make sure to note page numbers and issue numbers (for print) or to create a favourites bookmark folder (for online). This will avoid last minute panic. 2. After choosing your recipe, carefully read through each recipe. Make a categorized grocery list (i.e., sort by produce, deli, dairy, meat, grocery). 3. 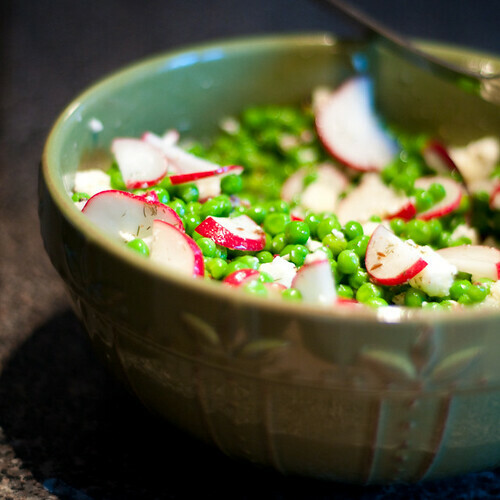 While making your grocery list, make note of all components that need to be made (i.e., for a salad, you need to prep veggies and make dressing. For a tart, you need to make crust, make filling and bake). While noting all of these components, make sure you write down baking times (i.e., make pork - 3 hours oven, make tart crush - 30 min rest, 30 min oven). 4. Make a game plan. I take a look at my component list (i.e., the dressings, crusts, seasonings, dishes) and figure out what HAS to be done (i.e., pork need to go into oven by four, in order to serve dinner at 7:30), and what needs to work around that (i.e., tart needs to bake before pork...MUST FINISH TART BY 4). From here, I am able to make a 'work order'. In this dinner, I started by making tart crust. 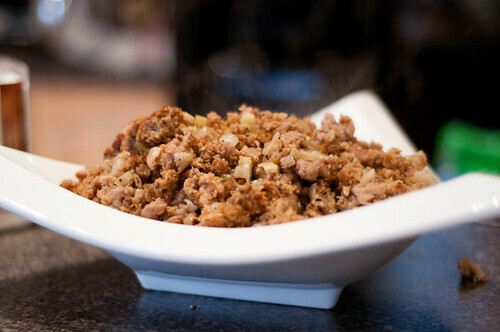 While the crust was resting, I made the pork stuffing. While the crust baked I made the tart filling. 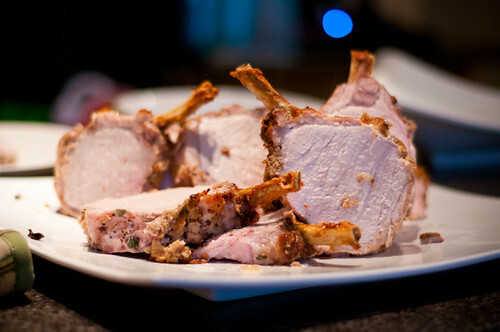 While the tart baked, I prepped the pork. While the pork baked, I made the potato gratin. 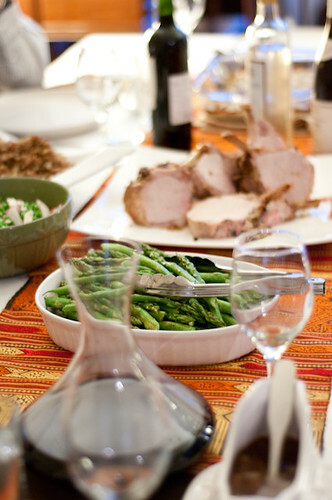 Things like veggies can (and are usually best) be left to the last minute. 5. It seems a little haphazard, but I find that having a plan makes me feel more confident and ready to get a meal (and a complicated one like this) on the table on time. 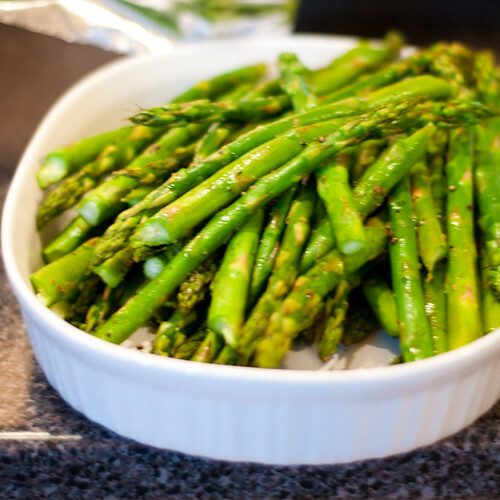 I also find that having a list of components is SUPER helpful when you have family coming, because you can assign and eager, early and willing family member to a component (i.e., make salad dressing, prep asparagus, chop onions, make breadcrumbs). I wouldn't do that for a fancy dinner party, but we all know it's different and more casual with (most?) families. I rocked it out pretty good...not gonna lie. 1. Cook onions with 1 1/2 teaspoons salt in 3/4 stick butter in a 12-inch heavy skillet over moderate heat, covered, stirring occasionally, until tender, about 10 minutes. 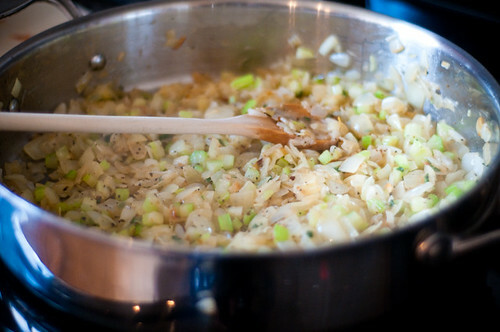 Add celery and continue to cook, uncovered, stirring frequently, until onions are pale golden, about 10 minutes more. Add sage, marjoram, and pepper and cook, stirring, 5 minutes. Add vinegar and wine and boil, stirring occasionally, until liquid is evaporated, then remove from heat. 2. Melt the remaining 3/4 stick of butter and pour over bread crumbs. Remove sausage from casings, break apart, and cook in a skillet over medium heat until nicely browned. 3. Reserve 1 cup onion mixture, covered and chilled, for sauce. 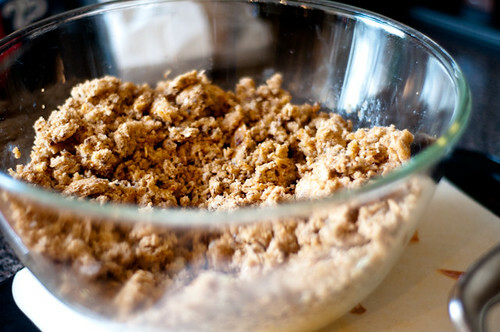 Transfer remaining mixture to a large bowl and combine with crumbs. 1. Put 1 oven rack in lower third of oven and another on bottom of oven and preheat oven to 350°F. 2. Stir together sage, marjoram, salt, and pepper in a small bowl, then rub over outside and bottom of roast. Put roast in a small flameproof roasting pan and mound 2 cups stuffing loosely in center, then add water (I used chicken brown) to pan. 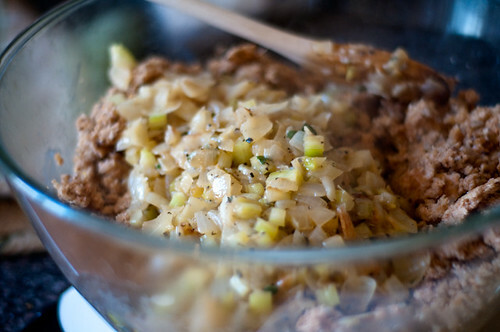 Transfer remaining stuffing to a buttered 2-quart baking dish and chill until ready to bake. 3. 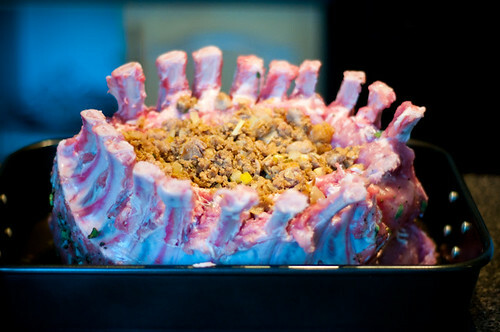 Roast pork in lower third of oven, covering stuffing and tips of ribs with a sheet of foil after about 30 minutes and adding more water if pan becomes dry, until thermometer inserted 2 inches into center of meat (do not touch bones) registers 155°F, 2 1/4 to 2 3/4 hours total. (If your guests are skittish about pink pork, as mine were, you'll want to cook your roast to a point where a thermometer inserted in the thinner side of the roast reads closer to 170F. The thicker side of the roast will still be juicy and delicious, but this way, you have some classically 'well-done' (*cough* overdone *cough*) pork for the squeamish. That said, pink pork is fine to eat. Transfer pork to a platter and let stand 30 minutes. Bake stuffing for 30-45 minutes, until heated through (as long as your sausage is well-cooked, you don't need to worry about reaching a certain temperature for this dish). ****NOTE: If you've let your pork rest, and you've cut into it and are completely skeeved by pinkness, just pan-sear the dinosaur-sized pork chops to your desired doneness, in a bit of olive oil and butter. But I swear, pink pork is deeeeeelish. Just don't serve it to the immuno-compromised (young kids, pregnant women, etc.). 1. Transfer pan juices from roasting pan to a gravy separator or a glass measure and skim off fat. 2. Straddle roasting pan across 2 burners, then add wine to pan and boil over high heat, stirring and scraping up brown bits, until reduced by about half, about 5 minutes. Add reserved onion mixture, broth, pan juices, and any juices on platter from roast and bring to a simmer. Restir cornstarch mixture and add to pan, whisking, then simmer 2 minutes. Add butter and swirl pan until incorporated. Season with salt and pepper. 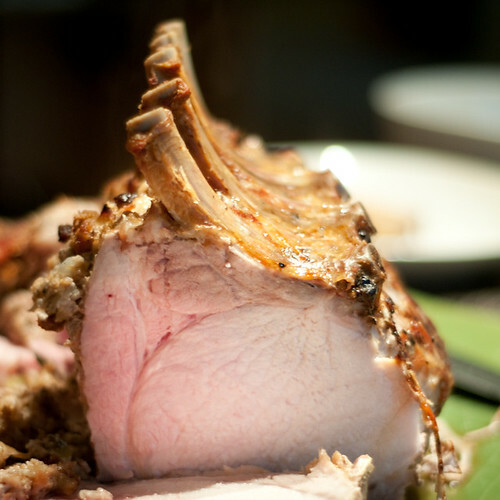 Carve pork and serve with stuffing and sauce. This is pretty good. Like I said, I found that parts of mine were (to my taste) overdone and a little dry, but parts will still juicy and delicious...so there's a little something for everyone with this dish. When in doubt, take some advice from my employer and get thyself a digital food thermometer and know how to use it. 2. Combine milk, cream, garlic, thyme and rosemary in a wide pot over medium heat and bring to a boil. Remove from heat. Add potatoes and stir together. Season well with salt and pepper. 3. Grease a gratin dish large enough to hold the potatoes (I increase the potato amount, so I just used a 9x13). Arrange a layer of potato slices in your dish. Cover with a thin layer of parmesan. 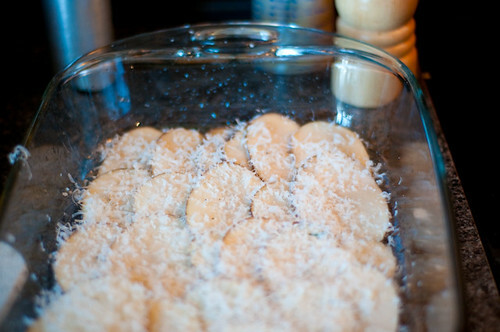 Repeat until you run out of potatoes, adding some fresh grated parmesan between each layer. 4. Pour remaining liquid over top. Add more parmesan. 5. Bake for 50 minutes- 1 hour, until potatoes are tender and liquid is absorbed. This is basically potatoes alfredo.....and it's pretty tasty. I think I would almost like it more with only milk, because I felt like the cream was just over the top. Not that that's a bad thing....BTW, I made mine in advance, and some of the raw potatoes were exposed to the air for a while...they got a little dark, and this is a bit unattractive. :p It's not harmful though...just a little ugly. I'm not going to post the recipes for my sides, because you can get them both on epicurious. They were yummy though, and provided some great colour and nutritional balance to the meal. (only change I made is to use caraway in lieu of cumin because I had a cumin-hating guest). Also, I did not have pea tendrils...not really sure where to find them). 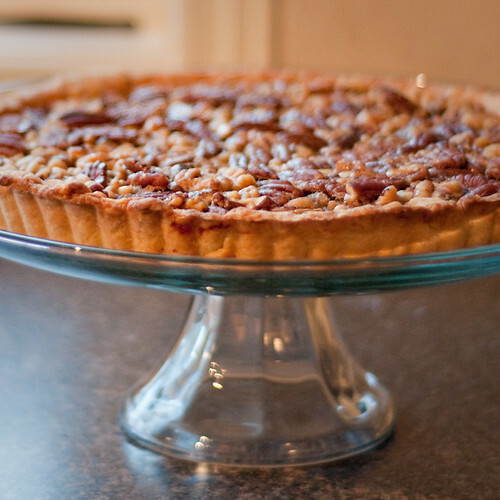 And for the finale, I made this delicious and sophisticated take on a pecan pie - a three-nut maple tart from the Spring 2011 issue of Food and Drink. I liked the incorporation of the pine nuts, and this gave me a great opportunity to showcase some of my uncle's amazing maple syrup (it is SO flavourful). As tarts go, this is not complicated. There is pastry...which I hate making....but this one turned out not too horrific.). The filling is very easy - toast (and don't burn) nuts, and top with a maple-egg filling. YUM. 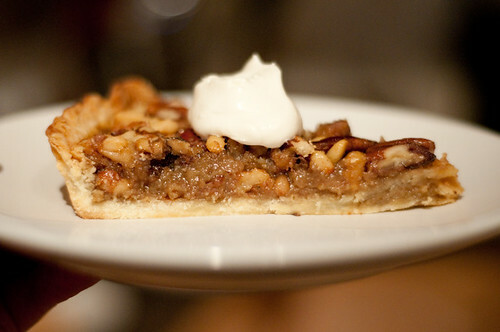 If you have nut/caramel/buttertart lovers, this is great. 1. Combine flour and sugar in food processor. Add in butter. Pulse a couple of times. Whisk together egg and vanilla in a measuring cup. Add enough ice water to make 1/2 c.
2. Drizzle egg mixture over flour. Process until it forms a ball. 3. Shape ball into a disc. Wrap in plastic wrap. Freeze for 15 minutes (or refrigerate for 30....I was in a hurry!). 5. Preheat oven to 375F. 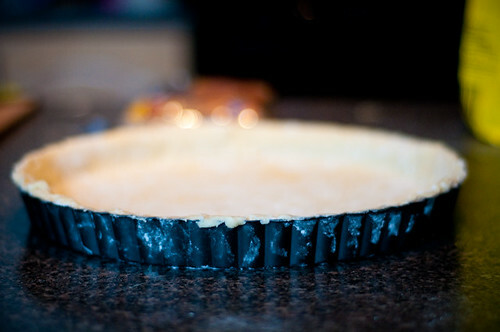 Line tart shell with foil, and fill with rice/beans (or pastry weights) to weigh pastry down. Place a baking sheet on the bottom rack in the oven, and bake the tart shell on the midde rack for 15-20 minutes, or until edges are dry. 6. Remove paper and bake for 5-10 minutes more, until starting to turn golden brown and firm. Let cool (but leave oven on). 7. 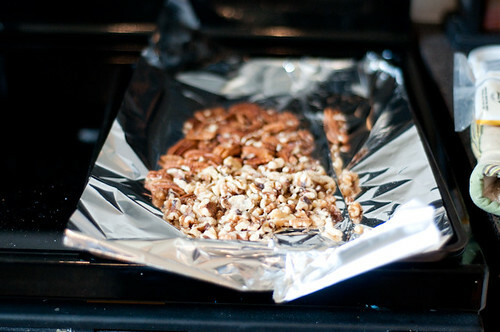 Spread pecans and walnuts on a rimmed baking sheet and toast for 3 minutes. Add pine nuts and stir. Toast for 3 more minutes. You could try to brown them a little more, but they will burn SUPER quickly...so I wouldn't. 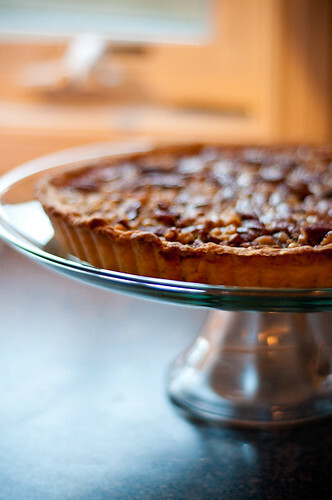 Scatter slightly-cooled toasty nuts in the baked tart shell. 8. Reduce oven temperature to 325F. 9. Whisk eggs, syrup, sugar, butter and vanilla until well-blended. Pour over nuts. For expediency and sanity's sakes, place your tart pan on a foil-lined pizza pan. Mine did not really leak, but tart pans can and DO leak, and you really don't want a burnt maple mess on the bottom of your oven. Bake for 30 minutes, until filling is puffed in the centre and just set around the edges. 10. Just before serving, whip cream in a chilled bowl until soft peaks form. Add in syrup. Serve with tart. Yummy. This would be a great fall recipe, but maple syrup is a spring thing, so I'm calling spring on it. A great finish to a delectable meal. looks yummy!! i totally do a plan when we do our big xmas dinners - grocery list, list of dishes, the "work plan" and the times for stuff to go in the oven and on the stove - it's a military procedure!! Cindy - military is absolutely the word. Hubs mocks me endlessly.